It was gonna be a busy day. I actually had to carry gifts for the people I was going to meet. I woke up early and packed my luggage. I would leave to Tokyo station, leave my luggage there and head to Saitama again. I was also going back to Enoshima Island in the afternoon, but at 2200, I would be meeting Kuze-san at Tokyo station for the Sunrise Seto train. So I decided to just carry essentials. This time to visit Mizuno Works. I headed on the JR, knowing I would have to jump train to get to Yoshikawa station (as I found out last night). Once I got to Yoshikawa station, I knew it was about a mile before I could reach Mizuno Works. It still pretty early as well, so when I got to the 7/11 there, I just had breakfast for 30 minutes. I headed back to Shin-Yokohama station via Shinkansen and I remember my friend Hector telling me about Refresh 60, A Datsun Bluebird specialist. I asked Kuze-san through text and he gave me the address. When I looked at the address, I saw that the shop was between Shin-Yokohama and Yokohama station by the Blue Line subway. So I decided to stop by real quick. Afterwards, I jumped on the Blue line again and 3 stops later, I was at Yokohama station. Satoshi-san said he will meet me there and we would go to Enoshima Island together. I did want to take go to Ofuna station and take the Monorail to Enoshima station, but since time was limited and Satoshi-san said there was traffic, I went with his plan. 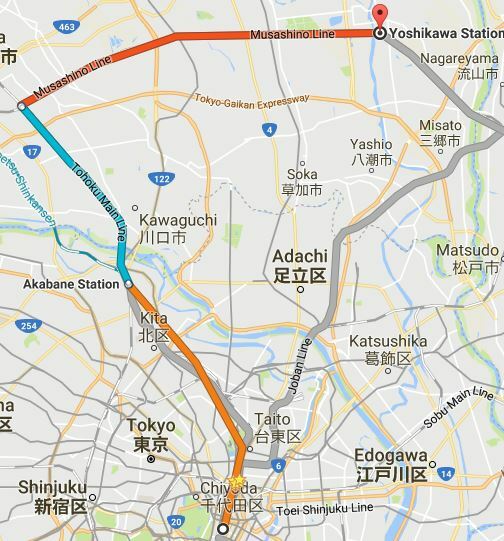 Satoshi-san dropped me off at Shinagawa station and said it was closer to Shinjuku station. I took the train to Shinjuku where I met up with Original JDM Guy. We had somewhat of a dinner snack and I didn’t realize I was behind in time! So we both walked to Shinjuku station and he said Tokyo station wouldn’t take that long to get to. The train took 3 stations to get to Tokyo, and I still had to get to platform 9. Seeing how I didn’t have time to get my luggage, I ended up leaving it in Tokyo station. I got to the platform with my essentials and gifts. I thanked Kuze and Kubo-san. Before I got on the train, I got an Ekiben (station bento box) and started to say my good byes. Sunrise Express and meeting wth Kuze and Kubo-san. That was a long day and took me from Yokohama to Saitama to Yokohama again to Tokyo for a train headed to Okayama. This entry was posted in blog, events, history, Meetings, Owners, review.